The event, presented by the Center for Western Studies and Augustana University, was held in the Elmen Center. Rice explained that the 2016 U.S. presidential election, one she described as the “Do you hear me now?” election, provided an opportunity for those figurative horsemen to ride out from the shadows. What America has going for it, Rice said, is technology, energy and a belief in human potential. And on human potential, Rice talked about the possibility she sees in future generations. "I teach in a university and this is the most public-minded generation of college students I’ve ever taught. They want to serve." American ingenuity, innovation and compassion are answers, too, Rice said. “America has faced tall orders before and has overcome them. If we are to sustain who we are then we have to stay in the game and we have to be confident,” she said. Ahead of the Boe Forum, Rice spoke to journalism students from area high schools as well as Augustana journalism and government majors. 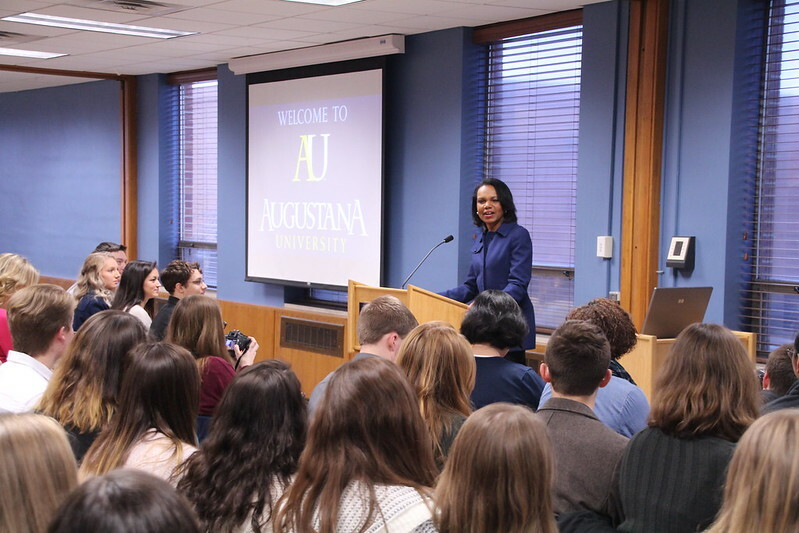 See how #AugieJourno students chronicled Rice's visit on social media.